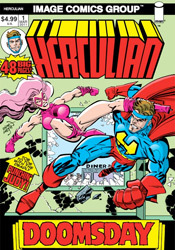 Though it may not appear to be the case from the cover, Herculian is a bit more than a simple, tongue-in-cheek homage to the bygone days of superheroic excess. Granted it’s not without such dalliances, but on the large this single-issue package is more like a stream of consciousness playground for one of the industry’s quirkier imaginations. Erik Larsen, who’s been virtually absorbed by Savage Dragon for the last two decades, obviously relishes this opportunity to open the cellar doors and let his inner miscreant out into the streets for a bit of off-color chaos, and that prospect alone is quite refreshing. Herculian’s self-contained set of short stories, backed by a full color print of “Guy Talk,” Larsen’s ever so slightly more straight-laced 24-hour comic, constantly test the limits of good taste to a variety of results. In this rare break from the stricter limitations of a regular ongoing series, he seems like a beast unchained, lashing out in all directions with unexpected vigor. With Larsen at the wheel, we’re on a hell bent joyride that swerves from acidic surrealism (the pathetic adventures of Cheesburgerhead) to sardonic black comedy (Mickey Maus, which is exactly what it sounds like) to indie fodder (the feature length diner chat of Guy Talk), with brief stops everywhere in between. Naturally, not all the directions Larsen takes are good ones, for a variety of reasons. Sometimes he nudges the envelope a bit too far into the realm of discomfort, others he’ll keep pressing on a gag that just isn’t working, but amidst the tragically failed experiments are an equal number that really get the job done. None are so memorable that I’ll be carrying them around with me for the rest of my life, but for a rapid-fire array of short diversions, they’re generally worth a glimpse. Beginning his career as an artist, it should be no surprise that the most interesting portions of Larsen’s work remain the visuals. In Herculian he’s decided on a weather worn style, complete with colors printed slightly out of registration and pseudo-dogeared pages, a simple but effective means of loosening up his readers’ expectations and transporting them back to the more carefree days of their youth, when a beloved comic would absorb food stains and lay under the couch for a year, not slide into a plastic sheath and hibernate in a long box. Erik’s style could never be accused of seeming overly disciplined, especially in more recent years, and that trend continues throughout this issue. In “Guy Talk,” which went from blank slate to completed project in a single day, his typically rushed compositions are surprisingly fleshed out and complete considering the circumstances. Seeing a similar haphazard approach applied to the rest of the issue gives the whole package a measure of sketchbook appeal, which I found perfectly suitable to the kind of throwaway gags he’s dispensing on each page. As an anthology of silly concepts and short-changed ideas, Herculian certainly could’ve been much worse. It delivers a few laughs, some interesting experiments in page layout and a few brow-furrowing shocks, but thankfully doesn’t make the mistake of taking itself very seriously. Larsen completists will want to add this one to their collections right away, but more casual observers of his career should use discretion. Flip through it.